Please tell us your pen name. Your book title, genre type, and series name, if applicable. 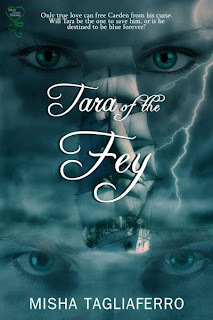 My name is Misha Tagliaferro, and my most recent release Tara of the Fey is a paranormal/fantasy romance. 3 words to describe yourself. 3 people you would like to thank. First off, I’d like to thank my sister. Without her encouragement, I never would have started writing. I’d also like to thank Secret Cravings Publishing/Sweet Cravings Publishing for believing in my work and giving me the opportunity to become a published author. And finally, I’d like to thank Kyle Lewis, my awesome editor who makes me grow as a writer every time I work with him. 1 sentence to describe your book. When a fey princess is abducted by one of the Blue Men of the Minch, she must look beyond his blue skin to the man inside. An excerpt from your book. The H.M.S. Fairweather glided peacefully through the Minch, heading due north between the island of Lewis and mainland Scotland. Caeden slowly moved his tail to keep himself steady in the icy waters as he kept a close watch on the ship, hoping for a glimpse of the young woman on board. He and his companions followed at a safe distance. If they were spotted too soon, it could spell disaster for Caeden and subject him to even more ridicule from his compatriots. “We’re only allowed the girl,” Duirkin said. The chosen leader for this rambunctious group of Blue Men, Duirkin was an older man everyone respected. Caeden missed Duirkin’s response, for over the rail of the ship appeared the face he had longed to see. Framed by flowing, golden hair, the delicate features and sparkling blue eyes gazing into the deep stole the oxygen from his gills. An emerald green dress of shimmering fabric draped her slender body—a body which had grown into that of a woman since he last saw her. 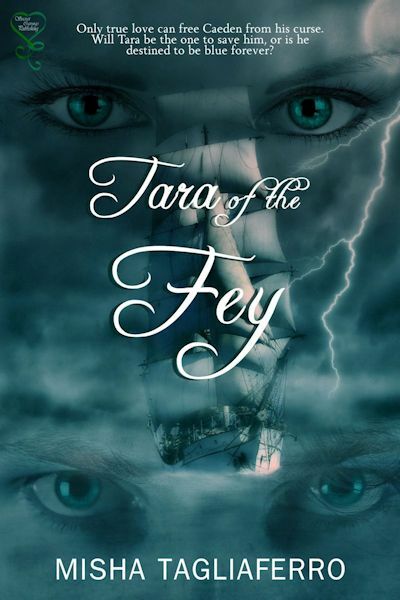 Although years had passed since he had been taken by the sea witch and cursed to live as a Blue Man, there was no mistaking Tara, his best friend and childhood crush. Her memory had kept him going through many long, lonely nights and given him hope that he might one day walk with her again along the shores of Garbh Eilean. So much depended on her acceptance of him now, much more than his companions knew—his very future was at stake. Please include a jpg of your cover art. A jpg of yourself, if you wish to. The buy links for your book and any other personal and promotional links you wish readers to know. Thank you Misha for joining us on The Romantic Muse Blogspot. Carolyn, Whitney, AP, and Jennie. Misha - how lovely to see you here. Thank you for sharing your snippets!